The co-op, which also owns food, travel, and Quadrant department stores across the region, raised funds through their employees and customers as part of their Charity of the Year Scheme. Money was collected through marathon runs, fancy dress, book sales and the generosity of their customers throughout a year of celebrations for their 150th birthday. Meanwhile, the funeral team did a sponsored walk that took in all their homes across Essex. Further funds were also raised by the charity itself through the signing up of shoppers to the Little Haven’s weekly draw. Specifically, £38,964 was raised in stores, with £38,948 pledged through the charity’s weekly draw. 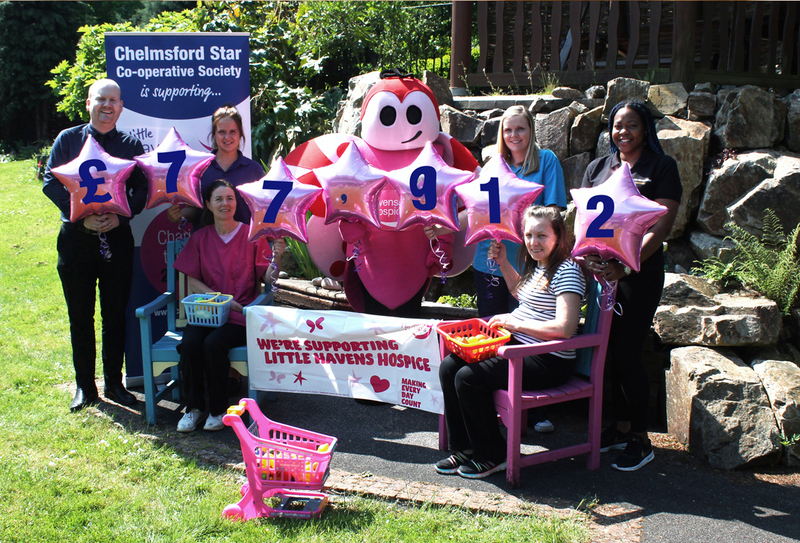 Carmel Hudson, Community Fundraising Manager for Little Havens Hospice, said; “On behalf of everyone at Little Havens I’d like to thank everyone at Chelmsford Star. We have to raise £46,000 a week to be there for every youngster that needs us. We can only do this because of the kindness of our supporters who fundraise for us like the staff and customers at Chelmsford Star.